In their characteristically modest way, Kapteyn and his wife Elise set off by bicycle from their home near Groningen. (One must presume that they sent their luggage on ahead!) They caught a train, then boarded a ship in Rotterdam for their first trip to the United States. A few weeks later they arrived at the scene of unparalleled festivities. The focal point of the 1200-acre St. Louis Exhibition was Festival Hall, a temporary but extremely ornate building set behind an artificial lagoon and flanked by sculptures and fountains. Its gold-leaf dome glinted in the Sun; inside, tourists found an auditorium seating 3500 and the largest pipe organ in the world. At night, half a million electric light bulbs and colored searchlights illuminated the buildings and fountains around the lagoon. The International Scientific Congress formed but a small part of the World Exhibition, and most visitors probably overlooked Kapteyn's lecture, which he contributed to the astronomy section. However, his lecture was arguably one of the best examples of the official theme of the Exhibition, ''the progress of man since the Louisiana Purchase'' about 100 years earlier. Secondly, superimposed on that well-known effect of solar motion, Kapteyn had found that stars tended to drift in one of only two directions. They did not, after all, move randomly in all directions. One set of stars appeared to drift in the direction of the constellation Orion, while the other set moved in the direction about 140° away, toward Sagittarius. All stars appeared to belong to one or other of these two streams. For Kapteyn, the two-stream effect suggested that our stellar system consisted of two giant clouds of stars moving through one another. Stars from the first mingled in space with stars from the second, but each star retained its original speed and direction. Thus his study of the structure of the stellar system led him to ponder also the history of the system, by extrapolating backward to a time when the two star clouds may have first drawn closer together. Kapteyn's discovery of the star-streaming pattern left his audience with plenty of food for thought—and that wasn't all he had to say. Before closing his lecture he issued a proposal to astronomers to attack the problem of the structure of the universe in a coordinated way. The unexpected discovery of star streaming, he felt, called for a renewed and systematic investigation into the stellar system. This was his famous Plan of Selected Areas proposal. The ''selected areas'' were representative patches of the sky, much like those William Herschel delineated when he sought to map the heavens. Some 200 000 stars would be observed, about twice the number Herschel had counted. Kapteyn was particularly eager to extend the collection of data to faint stars, which of course are more numerous than bright ones, to better test any theoretical models that might be constructed. He was aware that in selecting bright, high proper-motion stars for parallax determinations, astronomers were optimizing their chances of finding nearby stars with measurable parallax—but Kapteyn worried that the very act of selecting stars this way introduced some bias or skew in the conclusions drawn from the data. Collecting information on fainter stars impartially from all areas of the sky, he believed, would help assure the reliability of astronomers' view of the construction of the heavens. Kapteyn's proposal called for not just counting the stars in the selected areas, but for measuring all their relevant attributes: position, magnitude, proper motion, spectrum, radial velocity (i.e., the velocity in the line of sight between the observer and star, as Huggins had first measured), and parallax. The proposed method of attack would make efficient use of astronomers' observing time, for it would ensure that a complete set of useful measurements would be taken in widely scattered parts of the sky, without duplication or gaps in coverage. Laboratories like Kapteyn's in Groningen would carry out the analysis of data collected at observatories all over the world. 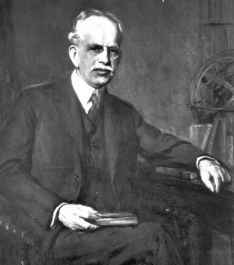 effect was on the grand master of American telescope-building, George Ellery Hale, who sat in his audience (figure 7.3). A young, highly entrepreneurial astronomer, Hale listened to these expansive ideas and felt himself drawn to Kapteyn as to a kindred spirit. Hale was then director of the Yerkes Observatory, the world's largest refracting or lens-based telescope. His main interest was the Sun, and he had organized a meeting of solar astronomers in St. Louis, alongside the International Scientific Congress, specifically to urge international cooperation in this field. In the same year as the St. Louis conference, Hale obtained an endowment from the Carnegie Institute of Washington for a new solar observatory on Mount Wilson. The main telescope of this solar observatory, which became operational in 1907, was in turn the world's largest—until 1917, when Hale again surpassed his own previous accomplishments and garnered funds for a 100-inch diameter telescope to be erected near the 60-inch telescope atop Mount Wilson. As we shall see, Hale followed through on his inclination to help Kapteyn, and at the St. Louis meeting took steps that would eventually tie not only Kapteyn, but generations of Dutch astronomers, to Mount Wilson Observatory. Kapteyn presented his Plan of Selected Areas proposal again a year later, at a gathering of the British Association for the Advancement of Science in South Africa. By 1907, when he was back home in Groningen, Kapteyn had secured all the cooperation and input he could hope for. Pickering, at Harvard, had not only agreed to help but had suggested 46 additional areas that he thought showed peculiarities in the distribution of stars that should be investigated.